Our 23 Day SUBLINGUAL Kit provides all the supplies needed to mix and orally administer your medicine. The 23 Day Kit is designed for maximum dosage over a 23 day period. 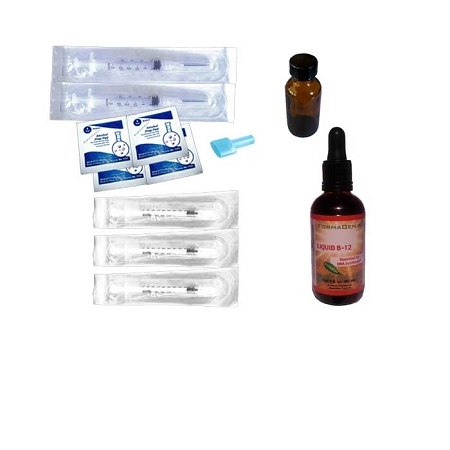 If you decide to dilute your dosage, this kit provides the mixing supplies for up to 40 DAYS of dosing. This is the perfect kit for those who prefer oral administration under the tongue instead of injections. Unlike other Sublingual (Oral) Kits, our Kits include a 30ml 100% glass Amber vial for safe and effective storage of your mixed solution. Also included are large 10ml Mixing Syringes for easy measuring and mixing (smaller mixing syringes are more difficult to use). We also include 10 sealed alcohol pads as you always should sterilize your mixing area prior to mixing. Finally, we provide you with a FormaGenix Ampule Opener for easy opening of your Ampule. As always, our products are factory sealed and name brands that you can trust for your safety ensuring an effective protocol.